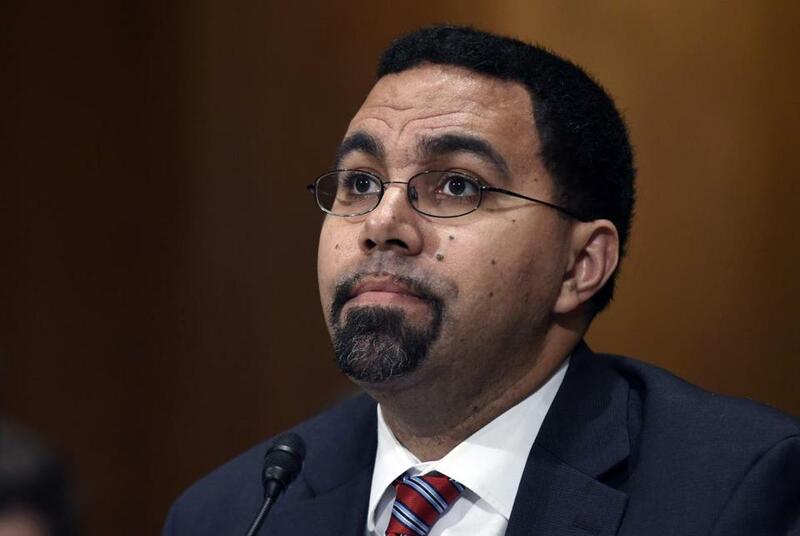 US Education Secretary John King. President Obama’s secretary of education is backing a Massachusetts ballot question that would allow for a major charter school expansion in the state. “Certainly if I lived in Massachusetts and was a Massachusetts voter, I would be voting in support of the ballot measure,” said John King, the secretary, in an interview with the Globe Friday night. King, who helped found a charter school in Boston, did not utter the word “endorsement,” even when pressed. But his comments offer the clearest indication yet that the Obama administration supports Question 2, a referendum that has attracted deep interest from national charter school advocates who view the state as an important testing ground. Millions of dollars in campaign donations have poured into the “Yes on 2” effort from around the country, and teachers unions have waged a sharp fight to beat back the measure, which would allow for 12 new or expanded charter schools per year. Charters, which currently number 78 statewide, have more control over budgets and hiring than traditional public schools and are generally not unionized. Urban charters in Massachusetts have produced strong results with black and Latino students and supporters hold them up as a vital alternative for families in poor neighborhoods. Critics say they drain too much money from the traditional public schools that serve most students. A Suffolk University-Boston Globe poll taken last week showed 45.4 percent of voters support the charter-expansion ballot measure and 45.4 percent oppose it. A more recent poll from Western New England University gives the “no” side a wide lead. King’s comments put him in league with the state’s Republican governor, Charlie Baker, who is a strong supporter of Question 2, and at odds with the Massachusetts Democratic Party, which opposes the measure along with prominent local Democrats Boston Mayor Martin J. Walsh and US Senator Elizabeth Warren. Several surveys show, to varying degrees, that rank-and-file Democratic voters have also turned against the measure in recent months. And proponents have been working to shore up left-leaning support, in part, by pointing to Hillary Clinton’s and Obama’s support for charter schools. Steve Crawford, a spokesman for the Campaign to Save Our Public Schools, which opposes Question 2, noted that King is on record saying charters and other schools have to rein in their sometimes strict discipline policies. And he pointed out that Roxbury Prep has had some of the highest suspension rates in the state in recent years. King, in his interview with the Globe, highlighted an Obama administration initiative to rethink school discipline practices and noted that Uncommon Schools, a charter network that includes Roxbury Prep, is participating. King said he has not spoken with Obama about Question 2 and noted that the president usually does not take positions on local issues.